Modernity is not particularly conducive to awe. We are painfully disconnected from the larger cycles of day, night, moon, and season, making it harder for us to witness or identify with the inspiring renewal all around us. Spirituality has become less of a state of being than yet another goal to attain in the future. Unlike today, the vast majority of humankind’s experience was spent understanding time as circular. Only recently did we adopt a more historical approach to time, and a correspondingly more aggressive way of manifesting our spiritual destiny. That’s the main difference between the spiritual systems that humans lived with over many millennia and the infant religions that fueled colonialism in the last dozen or so centuries. In a cyclical understanding of time, the consequences of one’s actions can never be externalized or avoided. Everyone reincarnates, so if you do something bad to another person, you’ll have to meet them again. If you spoil the natural world, you will be reborn into it yourself. Time and history are nonexistent, and the individual is living in the constant present. As a result, everything and everyone is interdependent and emanating from the same, shared source of life. The invention of writing gave people the ability to record the past and make promises into the future. Historical time was born, which marked the end of the spirituality of an eternal present, and the beginning of linear religion and monotheism. Before the notion of a past and a future, it was difficult to explain how a single, all-powerful god could exist if there was still so much wrong with Creation. With the addition of history, the imperfect world could be justified as a work in progress. God was perfect, but his plan for the world was not yet complete. Someday in the future, the messianic age would come, when God’s perfection would be manifest. Those who were faithful or remained on the good side of God’s law would end up okay in the end. The Bible was both the chronicle of a people’s emergence from slavery and a contract with God—a covenant—for their future prosperity if they followed his commandments. And so the duality of “before and after” became a central premise of religion. Things were now moving in one direction. Instead of the wholeness and possibility of a timeless, interconnected universe, the world of scripture had a timeline and destiny—at least for the faithful. The future was a work in progress for people and their God. 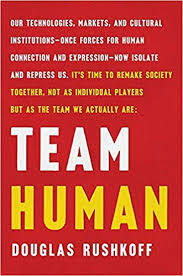 From Team Human, by Douglas Rushkoff. Copyright © 2019 by Douglas Rushkoff. Check out Douglas’s new book here. Browse Douglas Rushkoff’s audiobooks on BetterListen here.